Sometimes things in pop culture align perfectly. Whether it’s synching up Pink Floyd’s “Echoes” with the end of 2001: A Space Odyssey, or a bunch of anime clips cut to “The Becoming” by Nine Inch Nails, a combination of seemingly disparate elements can come together and perfectly distill both to reveals their true essence. 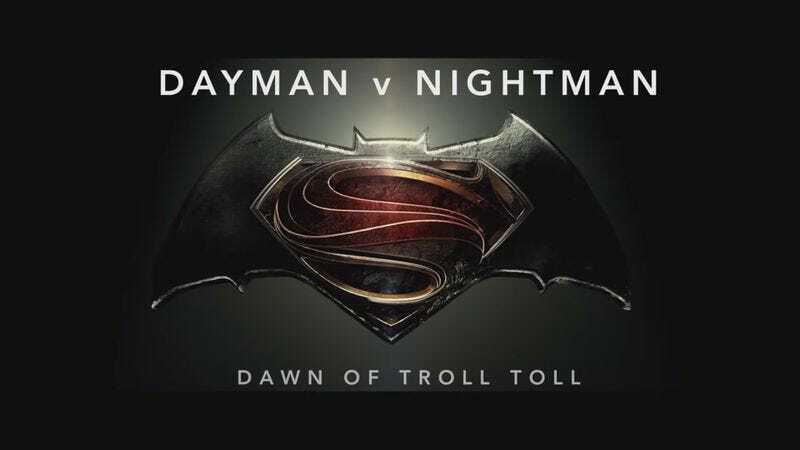 Such is the work of Albert Lopez, who has revealed that beneath all of the sturm und drang of the trailer, Batman V Superman: Dawn Of Justice really comes down to the simplest of oppositions: Nightman versus Dayman (champion of the sun). Using the amazing song from It’s Always Sunny In Philadelphia, as performed by Charlie Day and Glenn Howerton, Lopez reveals the simplistic core at the heart of the conflict. By recutting the trailer around the song, suddenly it all becomes clear this is nothing more than a big screen adaptation of a spray-paint-huffing-fueled musical masterpiece. It’s a brilliant mashup that elevates both works and makes it actually fun to watch all of the wanton destruction that Superman unleashes on the city and his enemies. Hopefully it’s not too late to get Day and Howerton to do the film’s soundtrack.